Who has been recently appointed as the new Head of Central Bureau of Investigation (CBI) ? Former ExxonMobil CEO _______________ has been appointed as US President Donald Trump's Secretary of State. 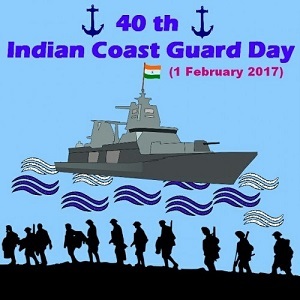 40th Indian Coast Guard Day was recently observed on ? Chewing gum is banned in ____________ to stop people from littering public places with chewing-gum litter. US President Donald Trump has nominated conservative judge ___________ to the Supreme Court, fulfilling his campaign promise to appoint a conservative justice to replace Antonin Scalia. Taking the number of AIIMS in the country to nine, the government has recently announced that 2 new All India Institute of Medical Sciences (AIIMS) will come up in which Indian states ? The Centre has approved an investment of Rs 1,350 crore to Andhra Pradesh for improvement of basic urban infrastructure under AMRUT over the next three fiscals. Expand AMRUT ? The Income Tax Department (ITD) has launched an e-platform to analyse large cash deposits made during the demonetisation window (9 November to 30 December 2016). Name it ? 14th Death anniversary of 1st Indian American woman in space was recently observed. Who is she ? Who has been recently appointed as the Commissioner of the Delhi Police, succeeding Alok Kumar Verma, who has been appointed new Director of CBI ? While presenting the Union Budget, finance Minister Arun Jaitley announced the launch of an online education platform that will give students access to over 350 courses. Name it ? World Wetlands Day is observed on ? What is the Theme of World Wetlands Day 2017 :?